A NEW CLUBHOUSE? NOW A 2 MILLION DOLLARS PRICE TAG……. The special meeting held Tuesday, July 24, 2018 at 7 pm in our existing clubhouse was the opportunity for property owners to see a presentation on the final plan and ideas for the proposed new clubhouse build the board has been talking about for the last 2-years. I was in attendance as I usually am taking notes to provide feedback to you, the readers of this blog and my neighbors. If you haven’t seen the presentation from the meeting yet, I’ve posted the key pictures and summary information from it here. Click here to see the presentation. This 2-year process began when an on-line survey reached SOME of the property owners of Timberwood Park requesting feedback for what the survey responders might want in a renovated or upgraded clubhouse. No-where in this survey did it say, “would you want or like to build a new clubhouse and pay for it?” This was the first mistake made in the process. The property owners who showed up at the meeting following the survey results were stunned to hear the board state they were largely considering building a new clubhouse at that time and were confused because they thought they had participated in responding to a remodel or renovation questionnaire. There were numerous people in the audience that evening unhappy about the fact that they hadn’t even been given a chance to participate in the survey. The process was flawed from the start and it truly has never recovered in part due to the lack of transparency and participation that is being offered during this entire process to the community at large, the property owners who will be paying the bill for what is ultimately decided. During that initial results meeting, property owners were also told there was to be an option to remodel or build new based extensive research, solid numbers provided for both options, and a process that looked at what the entire community might want in this project. Each of these items were to be presented to property owners to guide discussion and inclusion as to which option the property owners might feel was the best solution for our neighborhood. As early as this initial meeting, the board began exhibiting behavior when questioned about transparency and oversight and other standard business practices which included statements like “we don’t have to allow you to vote, we can make these decisions without your input” and “if you don’t like what we are doing, vote us out”. This did not appear to be listening to the entire population of Timberwood Park in a fair and equitable manner. And as a result, several campaigns were launched to point out the fact that this project could obligate us to a large amount of debt without a vote to determine whether we, the property owners, might even want the project. Contentious HOA meetings and objections continued to grow and ultimately the board decided to allow a vote for or against the clubhouse project. They further indicated property owners would be involved along the way in determining what features might be essential or wanted in the park under a master plan which was being developed as another arm of this project. I don’t know about you, but I never saw any official committees form with property owners who weren’t board members sitting on them to aid in providing feedback and getting information back out to the neighborhood as the progress continued did you? If you were on one of those committees, would you step up and tell us about your experience working on it and what it was called? Mysteriously, no options were ever presented again to remodel the existing footprint. Property owners were told at HOA meetings repeatedly this was impractical and unfeasible based on the board’s research in that regard and we needed to build new. The discussion switched immediately to building a new million-dollar clubhouse without a single vote from the property owners who would be paying for it agreeing to a new build or to spend that kind of money. No opportunities to provide feedback were sought when presentations were made regarding a master plan that an architect drew up which included a multi-use field/court if installed which would probably run somewhere in the 1-million-dollar range all by itself without including the maintenance costs to keep up the artificial surfaces which would be installed to make it multi-purpose. This architect was the same architect hired to render the clubhouse drawings who was ultimately released for lack of performance. Property owners were simply presented what the board called “final” plans when they were finished and there was no further discussion. Was there a property owner-based committee involved in this part of the process? The master plan developed utilizes every square inch of the 30-acre park we now enjoy. It turns the country park that draws people into Timberwood Park as something unique into a park that most municipalities would have available to the public to be utilized 24/7. Are we catering to outside neighbors who would like to spend their free time inside our private park? There are certainly enough who send messages through this website on a regular basis seeking the how-to that allows them to use the park, swim in the pool and attend the ‘private’ events sponsored by property owners in Timberwood Park to make one think that the grand plan might be to allow public activities like team sports, etc. What would parking look like then for the property owners who might want to use their “private” park? While there is always much grumbling about how difficult it is to keep the gate closed for events which are supposed to be private for the property owners of Timberwood Park to cut down on some of the neighboring development who now tag onto each event knowing they can come and go as they please even though they pay nothing to maintain the park nor pay for the activities within it, the one time we have a special meeting geared specifically to property owners the gate was closed for this private event. We haven’t seen the costs to plat the park, nor what if any restrictions, limitations or further studies might be required as a result. Perhaps a flood plain study will be required by the San Antonio River Authority since the park and Timberwood Park sit at the head of that watershed and anything we do on this park property can impact those downstream from us, both commercial and private property owners because construction will impact drainage and how it leaves the park from our catch basin we refer to as the lake. Have we budgeted those contingencies into this new 2-million-dollar clubhouse? As one property owner suggested on NextDoor posts I have read recently about this topic, what might be the possibility of property owners not being charged to use these brand-new facilities since we are paying so much for them? The answer: the board has clearly stated they plan to achieve even more revenue (to offset our costs paying for the clubhouse) by charging us all a premium to use it and went on to assume that because we have built a 2-million-dollar clubhouse rental use will increase. Would that be because we rent to outside events as well? As a property owner who has lived here for 13 years now, been on the board for a number of years, served the community for an extended period of time on various other community committees like the 281 Corridor project, the Dark Skies Committee, The Constable Commissioner Committee, and others, I understand the unique things which make Timberwood Park —-Timberwood Park. It amazes me that we are now discussing building a 2-million-dollar clubhouse via financing for 10 years obligating all property owners to the payback involved when we are more than capable of saving the dollars necessary to build should the community want it. Costs won’t change that much and according to the board we are nearly there in our cash available with the balance they quote available in our accounts at this writing….some 900,000 dollars and counting. Do you suppose any of that cash would be needed to repair existing amenities, maintain them, keep funds in reserve for emergency situations, or other needs the community might have? Do you believe this has been well planned, researched, designed, gotten ample feedback from property owners, is needed, wanted or even a consideration for most property owners? I think it would be great to learn who the “advisors from the community” the board enlisted for their expertise and feedback to round out what the board was discussing on behalf of all property owners. I’d like to know who spent time on the many projects like the second bathroom, which I have heard but cannot confirm is a fact, that the windows are a problem for potential peepers because of their installation height. Anyone know about this or hear of this complaint? Or maybe the lake re-seal? Who besides the board sat on committee reviewing some of the options, costs, contractors, etc. to ensure we got the best use of our dollars? I understand the contractor who was awarded the job is now out of business which means any potential warranty or repairs will be impossible with this original contractor. If a clubhouse idea that started 2 years ago with a figure of between 500,000 to 750,000 with 1 million dollars being the maximum we could expect it to cost can now be a 2 million dollar figure without any change orders, can we rely on the statements made and the promises provided with only verbal reassurances by board members that no increases will come to assessment fees, no special assessments will show up because we didn’t plan for contingencies like things we already have to maintain breaking down and needing to be repaired, and so on? For example, will there be a performance bond to ensure the contractors are held accountable for the project? Look at the package you have been given to decide with. Would you decide to spend this kind of money and obligate yourself to its payback with the information provided if it were within your personal ability to do so? Do you want to be obligated to this debt? Voting for or against this project is now underway with a cutoff date of August 6, 2018. You can go to the clubhouse on 7/30/18 from 5-7 pm to vote in person. You can go to the clubhouse on August 6, 2018 from 5-7 pm to vote in person. Post cards are supposed to be arriving in all property owner’s mailboxes describing how to vote on-line if you prefer. E-blasts are being sent out to give you an opportunity to cast your vote via an on-line option as well. There is an option on the Spectrum website if you click on Documents tab located to the left of the screen, then in the middle of the screen that drops down click on the drop-down options and scroll until you find “New Clubhouse Vote and Proposal” which is nearly buried toward the end of all the other documents posted there. In summary I am not opposed to improving amenities we all use and benefit from as property owners in Timberwood Park when it makes sense. Improvement is a good thing and can add to the quality of life in a community. It does not make sense to spend this huge amount of money to build a new clubhouse in our park! Asking for property owners to make limited time decisions without much detail for such a big expenditure seems rushed for no apparent reason. Perhaps town hall meetings for large scale discussion among property owners is something to be considered. The biggest problem to date seems to be very little transparency and almost no inclusion of the constituents the board professes to represent. It doesn’t appear there is much potential for that to change. Audience members suggested an oversight committee made up of property owners other than the board to provide an independent view of the project to property owners might be a good idea. The suggestion was made to use the pavilion as a multi-purpose room by enclosing it and remodeling it to some degree at a greatly reduced cost and taking up no new real estate in the process. Several other suggestions seemed to be heard but no response came from the board showing any sign of interest other than one board member who said “it’s in my best interest to make sure there are no change orders, I hate change orders”. Somehow that doesn’t bring much confidence this will keep costs in check. Should we property owners require more tangible specifics? Specifics like budgets should be posted with varying degrees of “what if’s” to give property owners a true sense of the costs really are long haul. Specifics like regularly scheduled town hall meetings allowing property owner feedback and suggestions to be considered and incorporated as the project moves along should it be approved. These should have taken place during the 2-year research process and didn’t. Specifics like the board should be transparent and as such welcome outside committees to oversee and provide an independent set of eyes and ears on the project to give property owners more confidence that full transparency is taking place. Specifics in writing like why this project went from a remodel to a new build, from 500,000 to 2 million all over a two-year period? And, no, tariffs did not raise the costs to this level as one board member suggested – construction costs have risen only slightly in the 10-15% range — not doubled over this 2-year period – this according to construction industry experts that were consulted. that Hollywood Park is a city and as such raised property taxes through bonds to pay for this project. that Hollywood Park is a City or municipality, so this is a City Public Park, which also received a $500,000 state grant to offset some of its costs. Do we have that going for us? There’s an Express News Article which speaks to all these facts. What’s important here is —— V O T E —— it matters because the outcome will affect you as a property owner in Timberwood Park for up to the next 10 years. Use your vote wisely! PROPERTY OWNER RIGHTS AND OBLIGATIONS….DO YOU KNOW YOURS? As a property owner, we each have certain rights granted to us when we purchase property. The most important of these is our deed restrictions which are a legally binding document that run with the land you purchase. Typically, when you purchase you receive a title report which includes your title to the property and the deed restrictions which govern your rights in the development in which you purchase. Timberwood Park was built on a platform that kept things simple. GG Gale, the original developer of Timberwood Park, lived by the “keep it simple” rule. He never liked overregulation and/or overzealous or overreaching HOAs which was why he kept the restrictions to your property to be on average, and this is unit by unit, about 15 numbered items. There are 3 or 4 items which discuss easements, and the remainder reflect those things considered unacceptable for the overall development standard. The goal was to minimize the influence an outside agency like an HOA could involve themselves with the use and enjoyment of a property owner’s property. The restrictions vary here and there unit by unit, which means one unit may have a restriction that another doesn’t or vice versa. Because Timberwood Park was developed as a custom home community– generally speaking no two homes are the same—likewise no two units are exactly the same with deed restrictions. Therefore we have what essentially is 60+ units of owners, each being able to manage their unit independent of another unit due to the differences in deed restrictions. What binds us all together is the park which we all own in common as property owners in Timberwood Park. For lack of a better word, we became self-ruling on January 1, 2011, when after a negotiated mediation the developer agreed to release their control of the neighborhood to the property owners of Timberwood Park. Since that time, we have been managed by a management company and HOA created during the turnover process that is supposed to be representing the best interest of ALL property owners. 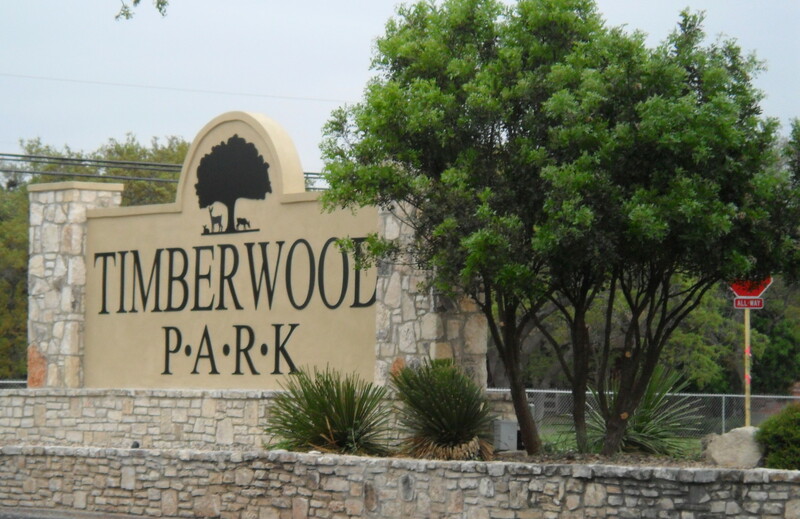 As owners in Timberwood Park, we have a unique opportunity to enjoy a beautiful 30-acre private park solely for owner use. This was one of the visionary aspects the developer decided would be an amazing addition to living in a custom home community outside city boundaries in what was “country” at the time. Since the original development began back in the 1970s there was nothing else around Timberwood Park and it was considered living in the country, just look at the difference now! The private park offers the opportunity to have events which were begun and held annually even before we were under self-rule like Music in the Park, Picnic in the Park, Easter Egg Hunts, have celebrations for your friends and family in the clubhouse, etc. It also allows for walking trails, playgrounds for the kids, a 7-acre lake to enjoy catch and release fishing in, and so much more. All these great, wonderful amenities, limited restrictions to the use and enjoyment of your property, living on larger, treed lots with abundant wildlife roaming freely, and we pay a mere $217.00 a year! What a bargain! So, that brings me to the point of this narrative. Wouldn’t it be sad if we found ourselves in the middle of something we don’t want to be a part of —- like a lawsuit settlement? There are currently several lawsuits either filed, pending, or in the process of being settled against our HOA. Each of these pertains to property rights, arbitrary regulation placed on the owner by the HOA which is does not have the legal right to do, and made up rules, regulations and specifications which not only were NOT voted on by property owners as our deed restrictions require but are not part of our deed restrictions…the ONLY legally binding document we, as property owners, are bound by in this development as to use of our property. The recent lawsuit most of you are aware of by now either from newsletter editorial, social media or other news outlets, was ultimately won in the Texas State Supreme Court on appeal. It is one example of a potential where property owners might have to share the bill for the ultimate settlement to the property owners who won their case because the HOA board believed they can rewrite/adapt existing deed restrictions with the flick of a pen and no property owner involvement or vote to accept those changes. The second lawsuit underway involves loss of use of property and rights of the property owner leaving a home sitting in a state of disrepair since 2015 when an improvement project was submitted for approval based on our existing deed restrictions. Interestingly enough this project was begun back in 2007 as a several piece or stage improvement project and was at that time initially approved for the incremental stages of the project as a part of the entire plan. The homeowner’s circumstances changed, and they were unable at that time to complete the original submission in its entirety. In good faith, they resubmitted the same plan in 2015 when they were ready to re-start the project to the current board for approval to continue and complete it and the board denied the project for several reasons, one of which was a masonry requirement for outbuildings which differs by deed restriction versus what the board was requiring at the time. The property owner attempted to work in good faith with the board to remedy the disparity between them but were unsuccessful. The HOA began assessing fines to the property owner for an incomplete project and during this 3-year process of negotiations and delays the property owner was ordered by the board to cease all construction. The property owners felt they had no choice but to file suit against the HOA to bring the matter to a close. And the icing on the cake—one of the property owners is a disabled veteran. How do you think this lawsuit will end? Similarly, to the previous one listed where the property owner prevailed? There is NO place in our deed restrictions that allows fines. Period. Yet from the period 2012 through 2017 our HOA collected from you, the property owner, $168,880.00 in fines! Were you one of those individuals who was fined? Check your deed restrictions. If any or all these things mean payback or payout to property owners for damages there will be an end to what our insurance will cover and where we, as property owners may/will be responsible for paying for these issues as they are settled. Everyone should be paying attention because this may cost YOU down the road as a property owner in Timberwood Park. That $217.00 a year won’t be the only thing you are paying. It’s great to keep moving forward and make the most of our park and its amenities. We’ve seen much needed improvements completed in the park under this HOA. We went from a developer controlling how to spend his money to a HOA board controlling how to spend “our” money. The HOA isn’t just about social activities and improvements to our park. It is supposed to be protecting our property rights not undermining them with arbitrary additional requirements and rules which do not exist legally in our deed restrictions. It is supposed to represent every property owner fairly and equally according to the legally binding rules which exist. If we are borrowing to build a new clubhouse, which looks like it might be the plan based on the discussion line item which addresses financing under the special meeting notice sent out for July 24th, we will be incurring debt which will have to be paid back. Or, in the alternative if we have the funds to build, we will be depleting funds which we may need to settle lawsuits? Will we also have debt to be paid for lawsuits which are underway, have been ruled on, or might be coming down the pike as well? What if property owners decide to sue for fines which were levied without legal means to do so? Will we be paying for the reimbursement of those monies as well? For all those property owners who are interested in newer, bigger and better don’t think that this property owner isn’t looking at best interest of the entire neighborhood. Keep in mind that while that new clubhouse is being built there will be no place for events to be held for your family and friends, no work out center, no ability to hold Music in the Park, etc. unless we totally overlook the liability of having people in the park in large numbers while construction is underway—both property owners and those who attend from the many neighboring developments now around us. There will be much liability with construction going on in the park — will we be closing it for the construction period? I’m sure all these things will be addressed at the special meeting July 24th. It’s in your best interest as a property owner to attend and hear the discussion first hand. Make time in your schedule and attend the meeting!